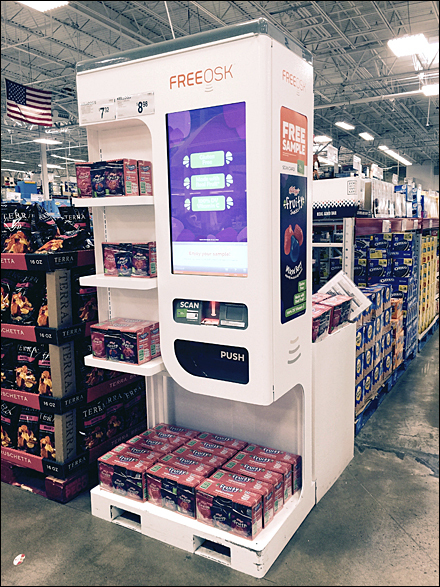 If human help is getting expensive, or not intrusive enough in offering samples, you might engage services like this Sam’s Club FreeOSK Automated Kiosk. It broadcasts the availability of free samples, offers the items for sale at left and below, plus collects data on users via Member Card Swipe. I managed to video during a quiet moment, but at times FreeOSK users were lined up 3 deep. A great innovation, with built-in forklift grabs below for easy movement. See the Sam’s Club FreeOSK Automated Kiosk thumbnail at left for a still view. For Retail Display in Motion YouTube posts by Title see..
“Digital Price Tickets Index Page” for all resources.